The King in Yellow by Robert W. Chambers and The Call of Cthulhu by H. P. Lovecraft The King in Yellow is a book of short stories by Robert W. Chambers, first published by F. Tennyson Neely in 1895. The book is named after a fictional play with the same title which recurs as a motif through some of the stories. The first half of the book features highly esteemed weird stories, and the book is described by S.T. Joshi as a classic in the field of the supernatural. There are 10 stories, the first four of which, "The Repairer of Reputations," "The Mask," "In the Court of the Dragon" and "The Yellow Sign," mention The King in Yellow, a forbidden play which induces despair or madness in those who read it. "The Yellow Sign" inspired a film of the same name released in 2001. The Call of Cthulhu is a short story by American writer H. P. Lovecraft. Written in the summer of 1926, it was first published in the pulp magazine Weird Tales, in February 1928. Cthulhu Mythos scholar Robert M. Price claims the irregular sonnet The Kraken, written in 1830 by Alfred Tennyson, is a major inspiration for Lovecraft's story, as both reference a huge aquatic creature sleeping for an eternity at the bottom of the ocean and destined to emerge from his slumber in an apocalyptic age. 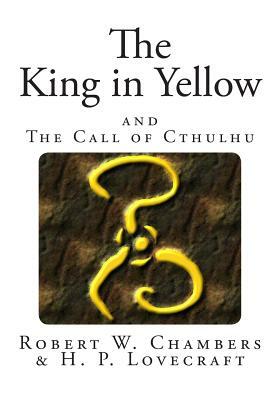 The King in Yellow and The Call of Cthulhu By Robert W. Chambers H. P. Lovecraft The King in Yellow is a book of short stories by Robert W. Chambers, first published by F. Tennyson Neely in 1895. The book is named after a fictional play with the same title which recurs as a motif through some of the stories. The first half of the book features highly esteemed weird stories, and the book is described by S.T. Joshi as a classic in the field of the supernatural. There are 10 stories, the first four of which, "The Repairer of Reputations," "The Mask," "In the Court of the Dragon" and "The Yellow Sign," mention The King in Yellow, a forbidden play which induces despair or madness in those who read it. "The Yellow Sign" inspired a film of the same name released in 2001. The Call of Cthulhu is a short story by American writer H. P. Lovecraft. Written in the summer of 1926, it was first published in the pulp magazine Weird Tales, in February 1928. Cthulhu Mythos scholar Robert M. Price claims the irregular sonnet The Kraken, written in 1830 by Alfred Tennyson, is a major inspiration for Lovecraft's story, as both reference a huge aquatic creature sleeping for an eternity at the bottom of the ocean and destined to emerge from his slumber in an apocalyptic age.